Latest AFP Exam Schedule for candidate soldiers, officers #OCC #OPC #CSC #AFPSAT - Exam News, Reviewer, Military Career, & Everything [MN] . . 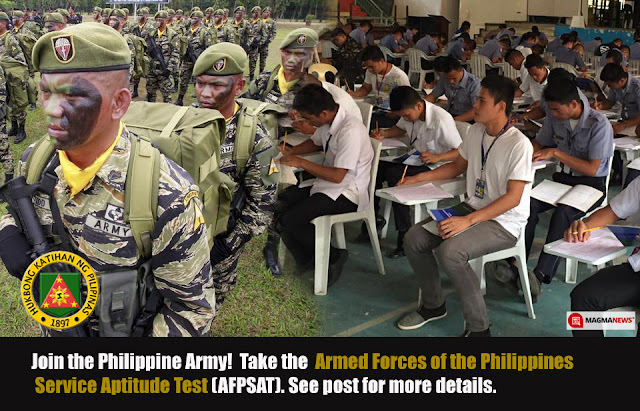 The Philippine Army is once again opening an opportunity for the Filipino youth who dreams to become soldiers or officers and to proudly serve the people and secure the land. The Philippine Army Recruitment Center Office will facilitate the Armed Forces of the Philippines Service Aptitude Test (AFPSAT) to qualified applicants for Officer Candidate Course (OCC), Officer Preparatory Course (OPC) and Candidate Soldier Course (CSC). For inquiries kindly contact Maj Marvin G Delos Santos, Chief, Army Recruitment Branch-Visayas and Tsg Noel D Cabides, Recruitment NCO with mobile numbers 0917-308-0641 and 0909-013-0250. Officer Candidate Course- Natural born Filipino citizen; Baccalaureate Degree Holder; 21 to 29 years old; must have completed at least one term or three years continuous active military service (for EP); single/never been married and has no legal obligation to support a child; at least 5 feet for both male and female; physically and mentally fit and has no pending case in any court of law. The OCC is a one-year course which prepares a candidate mentally, physically, and emotionally to become an army officer. Upon graduation, the individual will be commissioned as an Army 2nd Lieutenant into the Regular Force, Armed Forces of the Philippines (AFP). Officer Preparatory Course- Natural born Filipino citizen; Baccalaureate Degree Holder; Inactive Commissioned Reserved Officer who were commissioned in the Philippine Army under Circular 4 Group I and Group II; must not be over 31 years old on the date of Call to Active Duty (CAD); must have completed at least one term or three years continuous active military service (for EP); single/never been married and has no legal obligation to support a child; at least 5 feet for both male and female; physically and mentally fit and has no pending case in any court of law. Candidate Soldiers Course- Natural born Filipino citizen; single/never been married and has no legal obligation to support a child; preferably those who have 72 units in college; 18 to 26 years old but must not be 27 years old at the convening date; at least 5 feet for both male and female; physically and mentally fit and has no pending case in any court of law. If the applicant is only a High School graduate, s/he should possess special skills needed by the AFP or Philippine Army. Proof of such skills must be shown. The CSC will undergo three months basic military training and forty-five days Jungle Warfare and Mountain Operation Course (JWMOC) with rigid combat training to be enlisted into the regular force of the Armed Forces of the Philippines in the rank of private in the term of three years. Applicants shall bring the following at the examination center: NSO copy of Birth Certificate, Transcript of Records, Original Diploma with Form 137-A (for High School graduate), Valid ID, Ball pen and #2 pencil and long folder. Interested applicants may contact Major Marvin delos Santos at mobile number 0917-308-0641 or SSg Ronie Cornelio at mobile number 0916-640-5919. For more details, please contact the Army Recruitment Center (Main Office) at 845-9555 local 6843.